POLSON — “I love to cook steaks, and I love to eat Italian food,” Nathan Ricciardi said, smiling. Newly hired as the new executive chef at the KwaTaqNuk Resort and Casino, Ricciardi will be revamping the menus and turning The Nook, the KwaTaqNuk’s restaurant, into a steak house. He’ll also serve his Cajun scallop fettuccini Alfredo and Chester’s clambake, dinner favorites from Ricciardi’s on Main. Then Ricciardi talks steaks. The Nook will serve a bone-in rib eye, called the Yuba Dabba Do, a top sirloin, a flat iron steak and others. The R & R Ranch in Washington state will provide the meat, but the cattle come from Montana and some from Washington, Ricciardi said. Ricciardi has been in the business of cooking and serving food for 22 years, introduced as an 8-year-old and cooking by the time he was 16. “I’ve done it all — cook, serve, bartend,” he said, smiling and adjusting his chef’s toque. 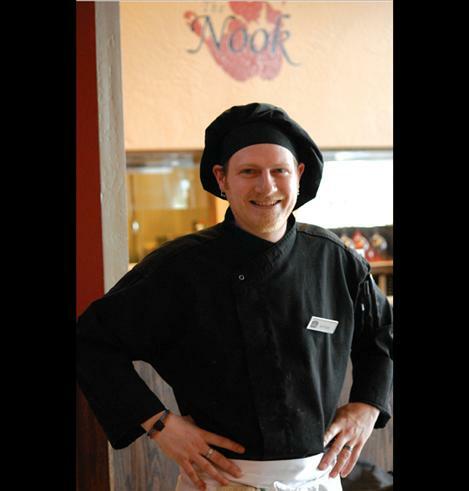 Stop by and try Ricciardi’s food at The Nook’s grand opening on Friday, May 23.